This beautiful young lady is slowly becoming a fashionista. From head to toe, Yara looks effortless. Last night was the 2016 BET Awards. Not only was it televised on BET, the show was shown live on VH1, MTV, SpikeTV (! ), Comedy Central (!! ), and Nickelodeon....? I guess, Viacom. I guess. For the newcomers of this blog, I have major love for the BET Awards (and the BET Hip Hop Awards, if I'm being all the way truthful). Each year, the show gets better and better. However, one area BET definitely has to improve on is how they go about selecting nominees for certain categories. Take for instance Best Group. The nominees were: The Internet (cool), Rae Sremmurd (MY BABIES! *ahem* cool), Puff Daddy and the Family (hmmmm...I mean...o-o-okay, fine...we'll go with it), 2 Chainz and Lil' Wayne (hahaha wait whaaa? ), and the winner, Drake & Future. *le sigh* C'mon, BET. Do better. Beyonce and Kendrick did their thang on Freedom. Loved the synchronized kicks in the water. I was very very impressed with the duo, Chloe and Halle. Prince's tribute was nicely done. I appreciated BET breaking up the tribute throughout the show. First group: The Roots, Erykah Badu, and Bilal. Second group: Stevie Wonder, Tori Kelly, and Jennifer Hudson. Third group: Maxwell and Janelle Monae. Final group and closer of the show: Sheila E and her band. Samuel L. Jackson was honored with the Lifetime Achievement Award and Jesse Williams was given the Humanitarian Award. To a standing ovation, Jesse bounded on stage, took his award, faced the mic with a "You gon' learn today" expression and proceeded to bless the audience and viewers at home with so much knowledge about today's injustice on black people. Dude was dropping word bombs. Some of my favorites: "If you have a critique for the resistance, for our resistance, then you better have an established record of critique of our oppression. If you have no interest in equal rights for black people, then do not make suggestions to those who do. Sit down." and "Yesterday would have been young Tamir Rice's 14th birthday. So, I don't want to hear anymore about how far we've come when paid public servants can pull a drive-by on a 12 year old playing alone in a park in broad daylight, killing him on television, and then going home to make a sandwich." and "Just because we're magic doesn't mean we're not real". Full transcript of his amazing speech here. Okey dokey. Red carpet time. Never heard of this girl until yesterday. Apparently, she's a popular Ghanaian musician who was nominated for Best International Artist. Her dress has an African vibe to it, no? The open-toe caged booties works perfectly with the pattern print. And I'm really diggin' the fringe hem. Too many arm bracelets, though. 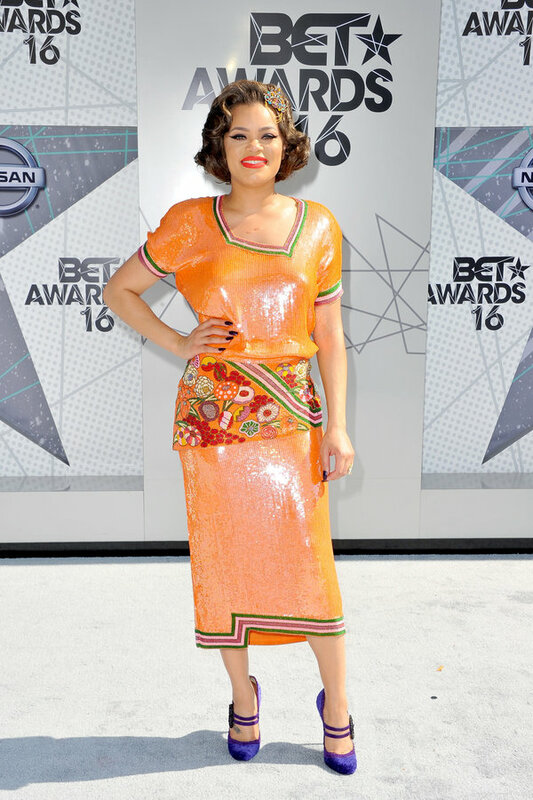 On the BET Awards pre-show, Andra mentioned that she's always inspired by vintage. So, I'm gonna assume this dress is vintage. It sure does look vintage. Gabrielle also rocked the red carpet with some African inspiration. Because that dress is very aso ebi-ish. I'm always happy to see her in braids/twists. I don't know. She looks great with that hair style. Only Janelle could make this work. Wished she went with a black clutch, instead. And I don't mind the hairdo, either. But her makeup is off. I'll blame the hot LA weather. Another lady whose makeup was iffy. But, my gosh, she sure looks pretty is this flirty teal dress. Did you watch the 2016 BET Awards? Any highlights? 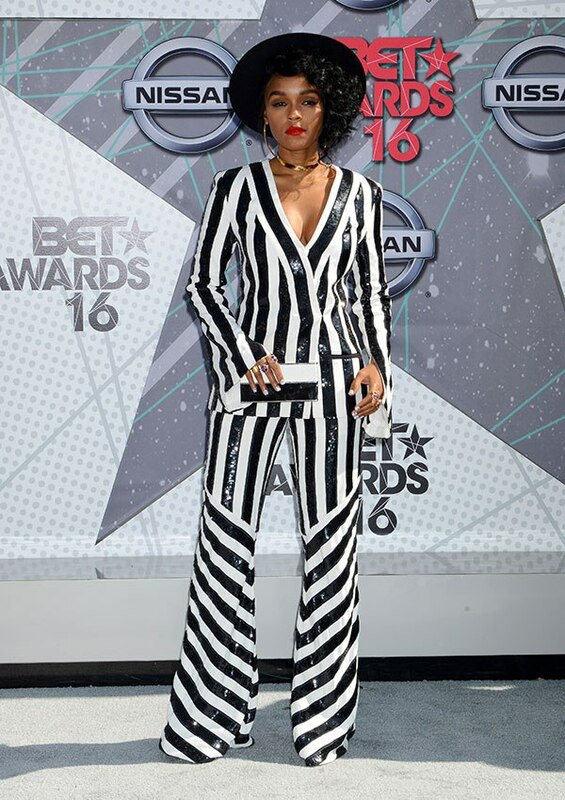 And for some more reading, check out previous BET Awards recaps: 2014 and 2015.